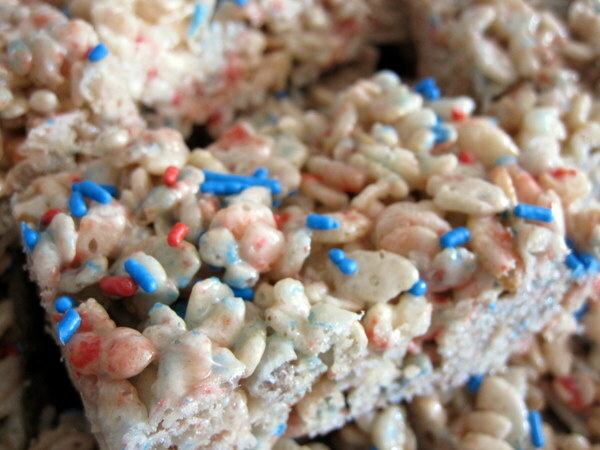 Wow, it must have been a while since I uploaded pictures from my camera to my computer because I just found some 4th of July Rice Krispie Treats I made for a friend's 4th BBQ at the beginning of the month. I thought about just skipping the post all together, but I guess better late than never since these treats can be customized for any holiday..... black and orange sprinkles for Halloween, orange and brown for Thanksgiving, green and red for Christmas, white and blue for Hanukkah... you get the idea! As usual, I was inspired by these treats on pinterest. Of course making them was a bit trial and error, not the rice krispies treats themselves, but when to add to the sprinkles. This is the recipe I used for the treats, the usual, but with a secret ingredient (vanilla extract)...mmmmm! Spray 9"x13" pan with non-stick cooking spray. Melt butter and marshmallows in a large pan over low heat. Stir frequently. Add Rice Krispies. Mix well. So I first added the sprinkles after I removed the mixture from heat and added vanilla. Unfortunately (or fortunately), this melted the sprinkles and led to splashes of red and blue in the inside of the treats. After I packed the treats into a glass pan I sprinkled more on top, which led to a nice festive look like the picture above. Next time I think I'll use a cookie cutter to make them in shapes too, stars for the 4th, bats for Halloween, mittens and snowman for the Holidays... endless ways to be creative! So cute! 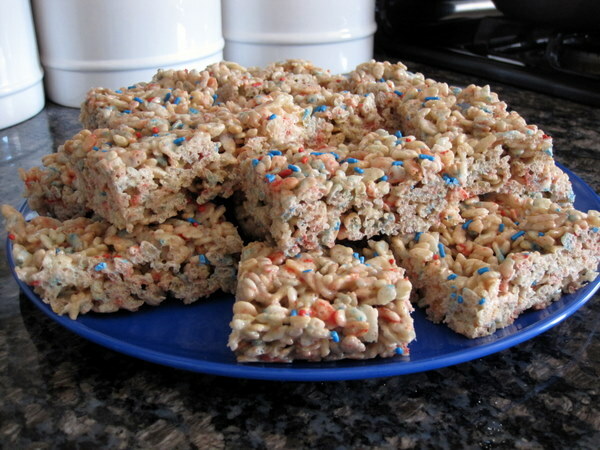 I love the patriotic rice krispies!! Yum! Great idea for the theme! I made the chocolate dipped ones you had on the blog for the 4th - and I looked high and low for red and blue sprinkles...where did you find them? ?